First, it is vitally important to note that this study did not actually examine rates of stillbirth, but rather 5-minute Apgar scores. The press release is completely misleading and inaccurate on this point. We will return to this issue below. This research stands in sharp contrast to a large and growing body of research that shows that, for low-risk women with a skilled midwife in attendance, home birth is a safe option for newborns with lower rates of interventions and complications for mothers. In addition, it opposes the enormous amount of research regarding the usefulness of birth certificate data to draw conclusions about rare outcomes. Haven’t we seen this guy before? These claims - and these co-authors - are not unfamiliar to home birth scholars. The first glimpse of this study’s results was seen at the Institute of Medicine’s “Research Issues in the Assessment of Birth Settings” workshop earlier this year. During Chervenak’s presentation of this data at the IOM workshop, serious concerns about the methodology were raised - none of which appear to have been addressed in this final article. So now that the full study is seeing the light of day, what are the concerns? And what does this research tell us? What are the limitations of birth certificate data for this kind of research? This research, which claims to be the largest study of its kind, relies on data from birth certificates (known as “vital records”). What we know about using information drawn from birth certificates is that they are pretty good for capturing information about things like mother’s age and whether she is carrying twins. They are not very accurate when it comes to rare outcomes like very low Apgar scores, seizures, or deaths (Northam & Knapp, 2006). Fortunately, these outcomes are extremely rare events, regardless of place of birth, but their rarity makes them quite difficult to study - especially when using a source of data that is known to be unreliable. With rare events, even a small number of miscounted events can distort findings and produce misleading interpretations. A second, deep concern is that birth certificates in almost half of U.S. states still do not adequately capture intendedplace of birth. This has been a fatal flaw in the few studies that have shown adverse outcomes with home birth, and it is a fatal flaw in this study as well. In recent well-designed studies that captured planned place of birth andused better sources of data, there were no differences in 5-minute Apgar scores between home and hospital settings (Hutton et al, 2009; Janssen et al, 2009; van der Kooy et al, 2011). The fact that vital statistics data can’t tell us much about the safety of home birth has been well-established by birth certificate scholars and epidemiologists. At the IOM workshop, Marian MacDorman, Senior Statistician at the National Center for Health Statistics, CDC, clarified how to interpret the this type of data. In response to Chervenak’s presentation on the data in this study, she pointed out that regarding low Apgar scores, “the absolute risk is low; that’s all you can say with vital data.” She also made clear that data from birth certificates cannot be used to make comparisons between settings or providers. What about equating low 5-minute Apgars with stillbirth? One assumes that the press release was perhaps not carefully reviewed by the authors of the study, as they did not actually examine data about stillbirths. They analyzed the rare occurrence of 5-minute Apgar scores of zero, which may be indicative of a number of possible events which may or may not have been related to the time, location or care provider at the birth. The authors note that stillbirths may have occurred in the third trimester, may have been due to lethal congenital anomalies, and other possibilities that are captured in a 5-minute Apgar score of zero. We cannot draw any conclusions about safety when looking at this piece of data in isolation. We will examine this issue and other methodological concerns more in depth in a later blog post, as will many home birth scholars, undoubtedly. However, if we are committed to providing women and their families with useful information about birth safety, our media materials need to correspond to the actual research conducted. Concerns that birth in any given setting may pose a risk to mothers or babies need to be taken seriously and examined closely. However, when the underlying data source is flawed, it is difficult to draw meaningful conclusions from the analysis of the data. To learn more about existing, well-designed home birth data, read here. To learn more about the MANA Stats Project, which provides researchers with a dataset of more than 24,000 planned home birth and birth center births, read here. And watch for new research based on the MANA Stats dataset 2004-2009. Two articles are in press and two more are under review in peer-reviewed journals. Wendy Gordon, LM, CPM, MPH is a midwife, mother and educator in the Seattle area. She has practiced for several years in both home and birth center settings with nurse-midwives and direct-entry midwives. She is a Coordinating Council member of the Midwives Alliance Division of Research, a board member of the Association of Midwifery Educators, and teaches at the Bastyr University Department of Midwifery. Hutton, E. K., Reitsma, E. H., & Kaufman, K. (2009). Outcomes associated with planned home and planned hospital births in low-risk women attended by midwives in Ontario, Canada, 2003-2006: A retrospective cohort study. BIRTH 36(3):180-189. Janssen, P. A., Saxell, L., Page, L. A., Klein, M. C., Liston, R. M., & Lee, S. K. (2009). Outcomes of planned home birth with registered midwife versus planned hospital birth with midwife or physician. CMAJ 181(6-7):377-383. Northam, S., & Knapp, T. R. (2006). The reliability and validity of birth certificates. JOGNN 35(1):3-12.
van der Kooy, J., Poeran, J., de Graaf, J. P., Birnie, E., Denktas, S., Steegers, E. A. P., & Bonsel, G. J. (2011). Planned home compared with planned hospital births in the Netherlands: Intrapartum and early neonatal death in low-risk pregnancies. Obstetrics & Gynecology 118(5):1037-1046. Recent Misleading "Home Birth Research" is NOT NEW! The OB/GYN physician who was presenting to the entire group gave similar statistics and "cautions" to those noted above and which, I knew - as a home birth advocate and CEA Child Birth Educator - were based on ALL out of hospital births from birth certificates. However, the way he spoke made them seem to represent planned home births with well trained midwives or knowledgeable others in attendance. When he quoted this study, I knew that most people in the room would know nothing about it nor it's inappropriate use of statistics and so I raised my hand to question the presenter about his knowledge of it. I was ignored for a bit before I simply stood up and asked him if he knew that this study included ALL the babies that were born outside of a hospital WITH NO TRAINED MIDWIFE OR other health care worker in attendance because of no other choice due to financial limitations or on the street due to a fast labor, in a car or taxi on the way to the hospital or in it's parking lot etc. Now in the year 2013 I ASK.... WHEN will this type of blatant misrepresentation of facts finally be acknowledged and ended? The newest study on home births showing a 10-14 fold increase in Apgar scores of zero in fact does look ONLY at home births performed by midwives. It EXCLUDES home births by anyone but midwives. What else but a planned birth is a home birth if done by a midwife? APGAR scores for unplanned home births? Some are saying that unplanned home births are included in this study..... Who is recording APGAR scores for unplanned home births? The explanation provided above is so vague. Did Wendy Gordon read the full papers before typing her response? *Specifically* what are the flaws in the study? It seems very thorough to me. Now that you are Director of Research Wendy. Can you please release the data regarding the neonatal deaths of Homebirth that MANA has refused to release under Melissa's tenor? It would be nice for American women to know when weighing the risks of choosing where to deliver. We know Homebirth offers fewer interventions, but what are the neonatals deaths rates. Also, I wanted to draw your attention to the last section of the post: "And watch for new research based on the MANA Stats dataset 2004-2009. Two articles are in press and two more are under review in peer-reviewed journals." These will include all relevant outcomes, including neonatal mortality and morbidity. "...for low-risk women with a skilled midwife in attendance..."
Could MANA please provide specifics regarding what qualifies pregnant women as 'low-risk' as well as the definition of a 'skilled' midwife? If you read the most recent data on patient characteristics in home births (including the most recent AJOG article as well as home birth advocate MacDorman CDC data), you can very easily see that a huge percentage of homebirth moms are NOT low risk. They are older, more likely post due dates and have more macrosomic babies. And then there are homebirtb VBACs. All associated with more bad outcomes. Midwifes are unable to screen women out and even then the outcomes are worse. FIRST - thanks to everyone for their comments and feedback. It is all appreciated. We've just launched and are working out a few kinks, like the way the comment conversations aren't quite "threading" together. "Could MANA please provide specifics regarding what qualifies pregnant women as 'low-risk' as well as the definition of a 'skilled' midwife? We really appreciate that question because we think it gets at the crux of many questions about home birth and home birth safety. There’s a lot of questions about what low-risk means. Some define low risk as a head-down, singleton baby born before 41 weeks. Others have varying definitions including some VBACs under certain conditions, or women in the 42nd week of pregnancy. This is part of the issue when looking at the data - we are debating whether or not women should have home birth, rather than looking at what circumstances pose a higher or lower risk. I am truly confused by your response and need your help please. MANA says homebirths are for " for low-risk women..". But now you are saying that "There’s a lot of questions about what low-risk means". You are right, there are a lot of questions but where are your answers? I am truly confused now and feel that if you from MANA cannot tell us what low risk means then how will a midwife decide on the right decision to allow a woman to have a homebirth? There is no definition just an open statement and more confusion? We truly need your help, not more confusion please. We completely agree. More research is needed into what constitutes low-risk for home birth. It is critically important that mothers and their care providers have accurate, evidence-based information so that they can make true informed consent. Risk factors that need further examination include breech, multiples, post-dates, and a variety of different VBAC circumstances. Please...for all mamas and babies! The debate over data and outcomes regarding homebirth seems to be never ending. How should we interpret numbers? What is our obliglation about honestly conveying risks to expecting mothers and families? The truth is that MANA has the ability to help shed light on these concerns by releasing all of its data, including neonatal mortality statistics. If the numbers are in line with claims that homebirth is truly as safe as hospital births, won't that be reassuring to the many women considering homebirth as an option? And won't that silence the critics, especially those that feel MANA is deliberately hiding alarming statistics? Conversely, if the numbers are worrisome, does that not open the dialogue about what needs to happen to make homebirth safer? Do women not deserve options for birth that all work towards the goal of maternal and neonatal health and well being? I hope that in the coming months, MANA will respond appropriately, and like any professional organization should, will fully disclose ALL of its data. It's just the right thing to do. Reply to Please . . . for all mamas and babies! Thank you for your comment. We couldn't agree more that women deserve the best available research so that they can decide for themselves which birth setting is best for their family. This is why the MANAstats project exists - to help individual midwives learn more about their practice, to guide critical policy decisions, and to provide families with high quality research they can use to guide their own decision-making processes. We appreciate the frustration you are expressing about the time it takes to make research available to the public. On average, it takes 1-2 years from the request for data to publication in a peer-reviewed data. This results in a lag time between data collection and publication. I also want to draw your attention to the last section of the post: "And watch for new research based on the MANA Stats dataset 2004-2009. Two articles are in press and two more are under review in peer-reviewed journals." These will include all relevant outcomes, including neonatal mortality and morbidity. How can I access the data? How can mothers access the data? I see from the ConnectMe program page that midwifery students and individual practicing midwives can get connected with a MANA research mentor,but it says nothing about how individuals who are not midwives or student midwives can access the data. Am I missing something? Reply to "How can I access the data?" "How can mothers access the data? I see from the ConnectMe program page that midwifery students and individual practicing midwives can get connected with a MANA research mentor,but it says nothing about how individuals who are not midwives or student midwives can access the data. Am I missing something?" In order to receive access to the data, researchers must have IRB and ethics approval from their home educational institution, which assures protection and ethical treatment of research participants. IRB approval is difficult to achieve without affiliation with an academic institution, which is why we established the ConnectMe program. It pairs mothers, others, and midwifery students with a primary investigator with an academic affiliation and access to an IRB or ethics board. To learn more, please refer to the contact information on the ConnectMe page. Clinical trials and studies that show a huge benefit or a huge detriment towards a condition during study will almost certainly report the initial findings early so doctors and patients can make wise decisions about their care. If your MANA stats are greatly favorable in safety, why are they not reported? If they show an increase in risk in neonatal death, they should already be reported. I am guessing they don't show either. Otherwise it is unethical to wait 1-5 years to report these facts. If they do show an increased risk and women who have chosen a Homebirth and had a bad outcome, could they file suit against MANA for delaying the release of information that may have allowed them to not deliver at home? Reply to "Lag time to publish"
Thanks again for your patience as we work out the issue of "threaded" comments. Please scroll down to read "lag time"'s full question, which asked a number of questions, including: " . . . it is unethical to wait 1-5 years to report these facts. If they do show an increased risk and women who have chosen a Homebirth and had a bad outcome, could they file suit against MANA for delaying the release of information that may have allowed them to not deliver at home?" Remember that MANA is a professional organization that maintains a dataset, not a regulatory agency. In every state where CPMs are regulated, there is a regulatory mechanism for reviewing neonatal and maternal mortality and morbidity. Ensuring safety of the public is the responsibility of individual states, not a professional organization. These state level regulatory bodies are the only ones with sufficient statutory authority to intervene when the public may be at risk. However, MANA is very committed to quality assurance and quality improvement, which is the responsibility of a professional organization. This is why MANA reports findings annually at the annual meeting. Less than one percent of US mothers choose home birth, which means it has taken multiple years for MANAstats to have a large enough dataset to be relevant for a peer reviewed journal. Now that the dataset size is large enough, we are looking forward to publication. Please watch for new research based on the MANA Stats dataset 2004-2009. Two articles are in press and two more are under review in peer-reviewed journals. These will look at all relevant outcomes, including maternal and neonatal mortality and morbidity. Home births (relative risk [RR], 10.55) and births in free-standing birth centers (RR, 3.56) attended by midwives had a significantly higher risk of a 5-minute Apgar score of 0 (P < .0001) than hospital births attended by physicians or midwives. Home births (RR, 3.80) and births in freestanding birth centers attended by midwives (RR, 1.88) had a significantly higher risk of neonatal seizures or serious neurologic dysfunction (P < .0001) than hospital births attended by physicians or midwives. So I'm not sure your objection about intended place of birth means much. Or are you saying that unattended home births that result in low Apgars are mistakenly being listed as midwife-attended? Who's recording the Apgars for these unintended home births? Reply to "From The Study Abstract"
"Or are you saying that unattended home births that result in low Apgars are mistakenly being listed as midwife-attended? Who's recording the Apgars for these unintended home births?" Thank you for your question. Here’s one of the challenges with birth certificate or vital statistics data. There is a big difference between where a birth was intended to take place, and where it actually took place. In the overwhelming majority of states, the birth certificate only captures where the birth actually took place (not the intended place of birth). Many births attended by midwives were intended to be born at home, but were transferred to the hospital. For many home birth practices, the transfer rate is at or above ten percent. While there are rare but tragic cases in which the transfer results in the death or injury of the baby, in the majority of cases, the transport is of first time mother who is exhausted and in need of pain relief. The result: while a small percentage of intended home birth deaths are wrongly attributed to hospital deaths using birth certificate data, a much larger percentage of home births with no injury to mother or baby are wrongly attributed to hospitals as well. Yes, but with 13,731,788 hospital births and only 102,296 out-of-hospital births, in order for the number of homebirth transfers with Apgars >0 mistakenly attributed to hospitals to positively affect hospital outcomes, it would have to be far higher than 10% to reach the impact of removing the small percentage of transfers with Apgars <0 from the OOH outcomes. So the data is still likely to be skewed in favor of OOH birth. Thank you, MANA, for this thoughtful analysis of the recent news coverage. It is helpful as I grow in my own understanding of home birth research and also as I talk with families. Your voice and perspective are appreciated! I'm glad to see someone raise sensible questions regarding methodology and interpretation (and causation versus correlation) in this study. It's alarming that AJOG would release information based on such little evidence as a birth certificate. I'm also not seeing any information about the size of the sample used--just a period of years?? You say: "First, it is vitally important to note that this study did not actually examine rates of stillbirth, but rather 5-minute Apgar scores. The press release is completely misleading and inaccurate on this point." Where does it go wrong? The definition of a stillbirth recommended by WHO is "a baby born with no signs of life at or after 28 weeks' gestation." An Aogar score of zero defines a baby with no signs of life. How do you define a stillbirth and what is the difference to an Apgar of zero? Do you plan to correct the misinformation Gordon posted? "What we know about using information drawn from birth certificates is that they are pretty good for capturing information about things like mother’s age and whether she is carrying twins. They are not very accurate when it comes to rare outcomes like very low Apgar scores, seizures, or deaths (Northam & Knapp, 2006)." But the Northam & Knapp article, SPECIFICALLY says the OPPOSITE! "Birthweight, Apgar score, and delivery method agreed 91.9% to 100%. The high-percent agreement supports the reliability of those variables …"
So the heart of Gordon’s argument is completely untrue. And Gordon referenced the mistruth with a citation that showed the opposite of what she claimed it showed. Do you plan to correct that misinformation? Looking forward to seeing the MANA Stats papers! Thanks so much for this post, Wendy and MANA. The new blog looks wonderful and I look forward to more thoughtful and important content. It's disappointing to see that birth certificate research to address the question of safety of homebirth is still finding its way through peer review. I thought the field was holding itself to higher scientific standards. I am very much looking forward to seeing the first papers from the MANA stats project. Thanks again for all you do! Thank you Wendy Gordon (and MANA) for teasing apart this information. I'm grateful to have this concise rebuttal to reference in discussions about home birth safety. Thank you Wendy and MANA for beginning to address the issues posed in this study. It is important that we remember that this study, and future studies of homebirth will be looked at with many critical eyes. As a midwife, I know how difficult it is to rely on birth certificates for information. In much of our country, planned place of birth is not asked, only the actual place of birth. Some areas ask for very specific information on neonatal ourcomes, but many of those are not know until well after the birth. I am unclear how an accurate accountlng of the outcomes could be garnered from birth certificates alone. "The result: while a small percentage of intended home birth deaths are wrongly attributed to hospital deaths using birth certificate data, a much larger percentage of home births with no injury to mother or baby are wrongly attributed to hospitals as well." But there were 200 times as many hospital births as homebirths, so even if a massive proportion of homebirth attempts ended in a live hospital birth, it would have NO IMPACT on the overall rate of hospital birth death or hospital live birth. However, since the number of women attempting homebirth is only 1/200th of that attempting hospital birth, and since death is a relatively rare outcome, leaving a few deaths out of the homebirth group would make a very big difference in the homebirth death rate. In other words, the hospital birth death rate is basically unaffected by the liveborn homebirth transfers, while the homebirth death rate is considerably lowered by removing the deaths that occurred after transfer. The study shows that homebirth increases the stillbirth rate by nearly 1000% and that's an underestimate of the true rate. 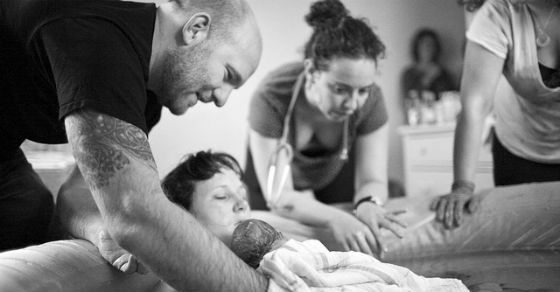 Thank you MANA, home birth midwives, and their advocates! I know those who want to take a woman's choice of where to birth away can be a strong force and often paid off by medical lobbies. Thank you for your diligent work in fact checking yet another garbage-quality anti-home birth piece and thank you for enduring this often unbearable comment thread. Those of us who know home birth know the truth behind the safety and know what's at stake by the erroneous publications trying to mislead women who simply want to make informed choices about their planned place of birth. Thank you for all of your hard work in this process! So, the researchers ONLY collected apgar scores at 5 minutes? While they were spending time and money processing this VAST amount of data, they didn't collect immediate apgar scores or followup scores? Why? And who was reporting the apgar score, and who was filling out the paperwork? Who says the score was X at 5 minutes? The parents? Midwives? Doctors? Why does this entire study seem like a load of crap? What about the other 99%? I wish there were this much scrutiny on hospital statistics, or the lack thereof! So many commenters here seem really upset about the accuracy of home birth data. The simple answer is, don't have a home birth if you don't think it's safe. In the meantime, I'd love to see the same level of criticism aimed at the places where 99% of women give birth, where we know there are lots and lots and lots of problems. Still births recorded on birth certificates? So I am completely confused. HOW is it that researchers, using birth certificate APGAR scores, regardless of 1 or 5 minutes, determine ANYTHING and conclude ANYTHING about STILLBIRTHS at home OR in hospital? STILLBORN BABIES ARE DEAD at birth and therefore are NOT recorded on a BIRTH CERTIFICATE at all. And since a stillborn baby was never alive at birth, no signs of life were recorded, no death certificate is issued either. STILLBIRTHS are RARELY captured accurately in Vital Records and this this "research" is profoundly flawed regardless of place of birth! Thanks for your questions relating to the topic of MANAstats and how and when that data is available. We hope the following will help answer all of your questions. Please read this first before asking a question about MANAstats release, as we’re going to limit new comments on the subject to questions not answered here. A common misconception is that MANAstats is a research project. MANAstats is a data registry, which gathers and makes high quality data available to researchers who apply for access. These data can then be analyzed by researchers, some of whom will have their work accepted for publication. This is similar to AABC’s Perinatal Data Registry and British Columbia’s Perinatal Registry. As a part of quality control and quality improvement, members of the MANA DOR give presentations at the annual meetings each year where key benchmarking variables are reported. This gives midwives an important tool for comparing their practice statistics to those of midwives across the country. Some of the researchers who have applied for access have submitted articles for review in peer-reviewed journals. Four articles have been submitted to date. Two are under review and two are in press. Midwives, mothers, and others interested in conducting research with MANA Stats data but who do not have academic affiliations and thus no access to IRB or ethics boards are invited to access the dataset through the DOR’s ConnectMe program. This program connects individuals with researchers for support and mentorship and provides the IRB access needed to allow non-academics to access the data while still maintaining ethical protection of research subjects. All academic journals require that researchers go through ethics or IRB review before conducting research, so this process also insures that applicants to the data set will be able to take their work through to publication if they so choose. Thanks to The Midwives Alliance and especially to the Division of Research for working long and hard to include all of the very complicated financial, gender, educational, cultural, political and spiritual issues surrounding the history of and the future of using evidence based care to create safety for all as we give birth at home and in other settings and situations as well. It is so easy for people with vested power and interests to leave out other people and/or the ways - check boxes, questions, contexts, spaces on forms etc. - that are necessary to accurately report the truth of each individual birth situation as a part of the whole. It is also easy for such people to "massage the data" - a term I quote directly as I heard it said "with a smile" from the lips of my boss - while I worked as the Women's Health Nurse Consultant for The Bureau of Maternal and Child Health in New Hampshire and was in charge of the NH Midwifery Certification, Family Planning and Prenatal Programs. With so much "power over" practiced, for so long in worldwide cultures, it is difficult for any truth to come into the light just now. The average person lacks knowledge regarding the practice and ethics of many things including evidence based data collection and therefore relies on "experts" for everything as the serious problems we are experiencing with the quality of health care provision, statistical reporting and ethical oversight become ever more multifaceted and daunting. So, PLEASE KEEP GOING MANA - because you are doing essential and difficult work for ALL! What about the other birth cert data? But what about the other birth data? And who is filing these certificates? Who is assessing these five minute Apgars of O, and what are the 10 minute scores? When a 5 min Apgar of less than 7 is recorded on my State's electronic birth cert filing program, it automatically requires a 10 minute score. This score would only be absent on a legal certification in my state if the infant never had another Apgar assessment, in which case s/he would be dead, and a death certificate would be filed instead. There are also sections asking if the infant was transferred within 24 hours and if the infant died after a live birth. To the extent that it is possible to infer anything from birth certificate data, a well done study might have included this information in their analysis, as well as looking at reported abnormal conditions of the newborn, congenital anomalies, characteristics of labor, and maternal morbidity, all of which can be found right there on the same certificate. That the researchers had access to this data is proven by the inclusion of the relative incidence of "seizures or serious neurological dysfunction" in their data set. What is interesting to me is that none of the other "abnormal conditions of the newborn" included on all US birth certificates are even discussed in this study. Are we to assume that these seizures and neurological dysfunctions happened in a vacuum, unrelated to assisted ventilation, admission to NICU, or suspected neonatal infection? Who made these assessments of neurological dysfunction, anyway? And are these a subset of the neonates with the dubious Apgar scores, an entirely different subset with their own outcomes, or what? I just don't understand why Chervenak, et al chose to focus particularly on seizures and 5 minute Apgar scores, and how they believe this data,extracted willy-nilly from a larger set of statistical information, can really be useful as "prognostic data for future outcomes." I do understand that the researchers in this case have an obvious bias, and are merely furthering the stated agenda of ACOG to aggressively hold their ground against the "recrudescence" of home birth by cherry picking the data, but all it really proves is that birth certificate statistics are an easily exploited but ultimately unreliable source for that data, as was already proven by the notorious and embarrassingly flawed Pang study, which no one (except midwives,haha) wants to talk about anymore. Come on ACOG, you can do better than that.